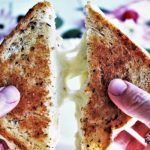 You are here: Home / Vegan Cheeses / Vegan Grilled Cheese – Cheese that Melts! Are you craving a vegan grilled cheese sandwich made with cheese that melts? 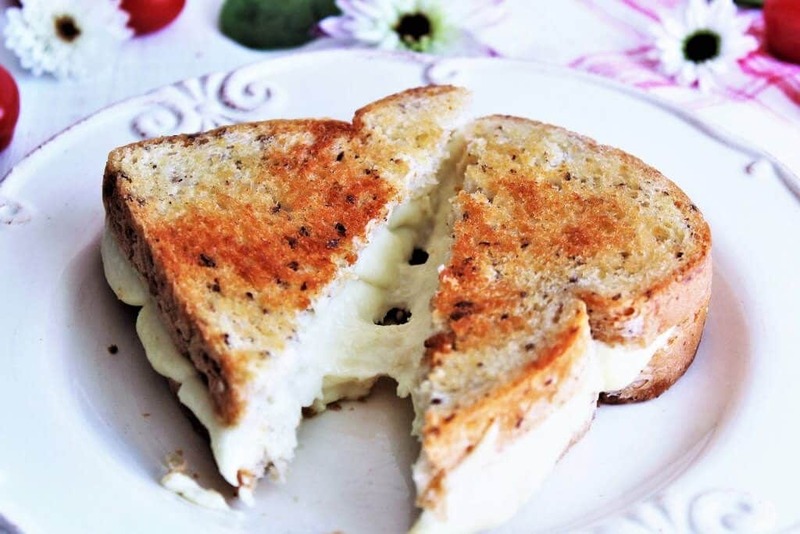 Use my melty cheese recipe to make the best grilled cheese you have had since giving up dairy! 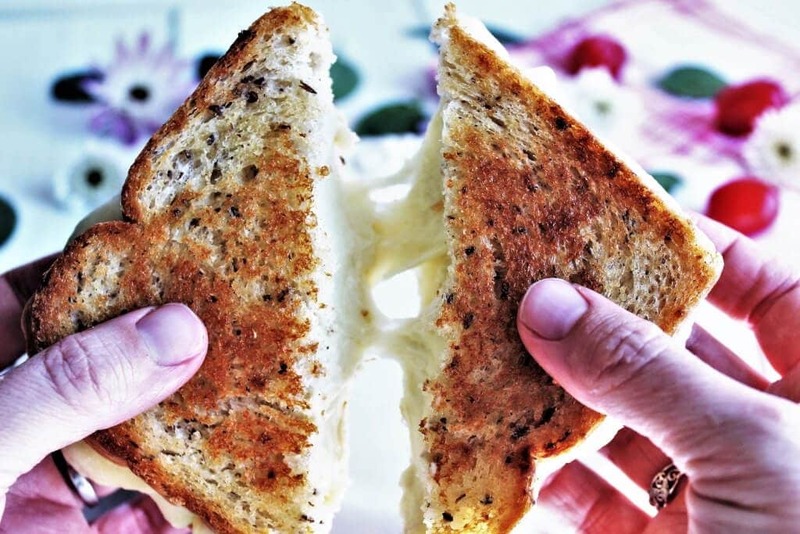 The secret to a great vegan grilled cheese is using a cheese that melts and stretches! I’ve spent the last few years playing around with vegan cheese recipes to get the perfect melty cheese to use in grilled cheese sandwiches and I’ve finally perfected it! 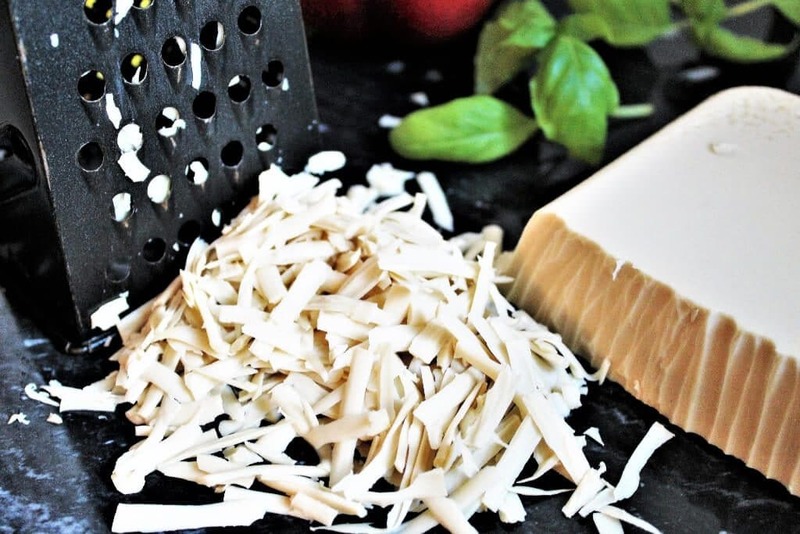 What type of plant-based milk is best for making vegan cheese? 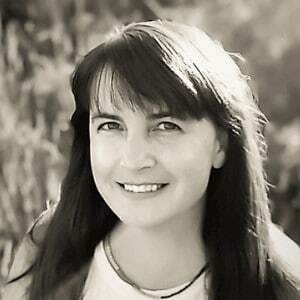 I use full-fat canned coconut milk to make my vegan cheese recipes. It has a fat content and creaminess similar to real cheese. I’ve tried it with soy milk, cashew cream, and almond milk, but the coconut cheese always comes out the richest and creamiest. How do I make vegan cheese that melts and stretches? The secret to making vegan cheese that melts and stretches is tapioca starch. It gives the cheese a very stretchy texture. Make sure to use the exact amount of tapioca starch when making this recipe. If you use too much your cheese won’t set and you won’t be able to slice or shred it. If you use too little, the cheese will be too hard and not melt until it reaches high temperatures. What makes vegan cheese set? Agar agar is a key ingredient to make vegan cheese set. Without it, your cheese will be a great tasting cheese sauce, but you will not be able to shed or slice it. Agar agar is a clear powder made from seaweed and it works like gelatin. It must be cooked for at least 6 minutes to fully melt and bind with your cheese and it will then become firm once it cools. Note: Agar Agar can be hard to find and expensive at health food or specialty stores. You will find the best price at your local Asian market or on Amazon. How do I make the perfect cheese to make a vegan grilled cheese sandwich? Then pour the cheese into an oiled glass container. (One batch makes almost 2 cups of cheese). I like to use these Snapware containers because they are made of glass and won’t affect the flavor and have a lid with a good airtight lid to keep the cheese fresh longer. How can I flavor the cheese to make other varieties? My favorite variety of this vegan cheese vegan smoked gouda! It’s amazing on a grilled cheese sandwich or used on smoked gouda pizza! How do I make a perfect vegan grilled cheese? Use vegan margarine (or my vegan butter recipe) to spread on a slice of bread. Turn your frying pan or skillet to low heat and set the bread butter side down. Then layer with slices of cheese and add any other favorites like sliced tomatoes, artichoke spread or vegan pesto! Heat on low for about 5 minutes on each side until browned. It’s important to heat it slowly on the skillet so it doesn’t burn and so the cheese in the middle has time to melt. Tip: If you have time, let the cheese warm up to room temperature before heating the sandwich on the skillet or heat in the microwave for about 20 seconds to warm up the cheese. What bread is vegan and gluten-free? If you are vegan and need to be gluten free as well, there are not many types of bread to choose from. Most of the major brands of gluten-free bread contain egg, so make sure to read the packaging. Some smaller local bakeries make gluten-free vegan bread, so it will vary depending on where you live. Our favorite bread and the one in the pictures is a millet bread from Sami’s Bakery. (No gluten ingredients, but not a gluten-free facility). Aldi also occasionally has a seeded bread that is gluten-free and vegan. Aldi also carries our favorite gluten-free/ vegan tortillas that you can use to make quesadillas if you can’t find a bread that you like. Want a cheese that is great for slicing and eating cold? Check out my sliceable vegan smoked gouda and vegan garlic herb cheeses! Don’t forget to pin the vegan grilled cheese for later! Recipe for making vegan cheese that will melt on a vegan grilled cheese sandwich. Butter 1 side of 2 slices of bread. Place one slice butter side down on the skillet and add sliced cheese and the other slice of bread on top. Grill over a low heat for about 5 minutes on each side until golden brown and cheese are melted. Make sure to cook the grilled cheese sandwich on a low heat to give the cheese time to melt. You can also heat the sandwich in the microwave for 20 -30 seconds to melt the cheese before grilling to save time and melt thoroughly. Delicious with sliced tomatoes and vegan pesto! Yes, you can freeze this cheese. Hope you enjoy it! 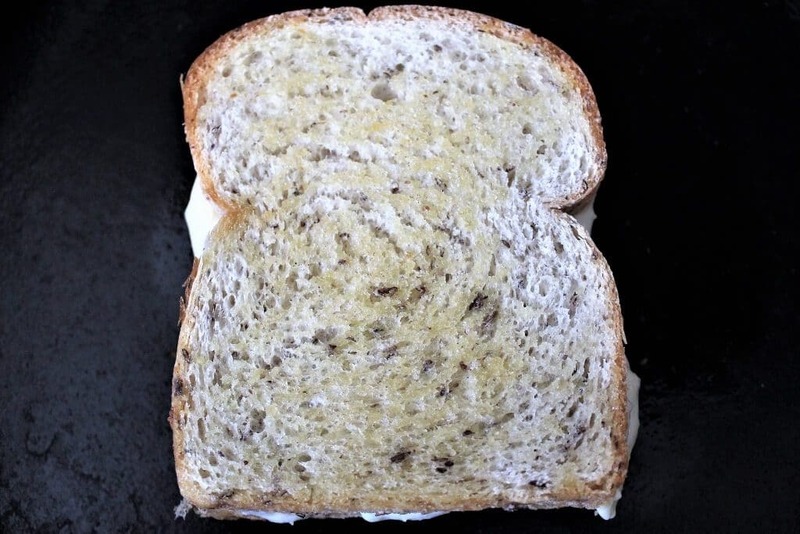 Is the bread used as an ingredient in the recipe or just for the sandwich? Hi: I see so many using Coconut Milk (canned) to get creaminess in recipes (especially ice cream). As someone who really really dislikes coconut (even a hint of it, like when I tried Nada Moo ice cream recently) – can I ask whether it has a flavor or hint of coconut when using it to make cheese? I use “refined coconut oil” all of the time in my recipes, and I know it has NO hint of flavor which I love. Can the same be said of what you recommend in your recipe? Thanks so much for the help! Hi Tiffany, Yes, it will have a slight coconut flavor, so if you don’t like that, I would make it with soy milk and added oil to get a similar richness that coconut milk would have. Hope it works for you! How do I determine which brand of coconut milk is “full fat”? Can you recommend a brand please? Hi there! This looks great! Just curios, is there any sub for tapioca starch? Arrowroot powder? No, there is no sub for tapioca starch that I know of. It it the only thing that makes it stretch. You can leave it out and it’s a great cheese for slicing and eating cold, but it will not melt. OMG….God how I’ve missed you Grilled Cheese! It’s so good to have you back in my life!